This lightly spiced drink is the perfect winter warmer. 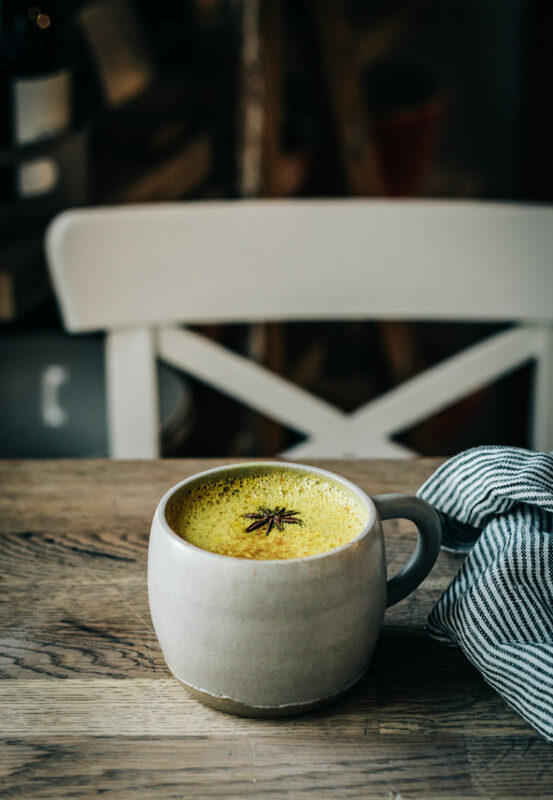 It’s chock full of my favorite spices and is wonderful to sip first thing in the morning or right before bed. It’s comforting, and its bright orange hue (thanks to the turmeric) is a sure way to brighten up a gloomy winter day. We used raw goat milk for this recipe and it lended a wonderfully rich and creamy element that took it over the top. However, feel free to use full fat cow’s milk or any other milk you prefer. The secret is in the spices and I hope you all enjoy this drink as much as we have. If you’ve been following along on my instagram stories you know we’ve been waking up with this special latte daily and after a lot of requests for the recipe here you all go! Whisk milk, cinnamon, turmeric, ginger, peppercorns, honey and 1 cup water in a small saucepan; bring to a low boil. Reduce heat and simmer until flavors have melded, about 10 minutes. Strain through a fine-mesh sieve into a blender. Blend on high for a few seconds until frothy. Divide between two mugs and serve with a sprinkling of cinnamon and optional star anise. *The blending step is optional. You can simply skip that part and stain the milk into mugs directly. However, that will result in a less frothy beverage. i love this recipe thanks for sharing and God bless y’all. I love this drink. It’s like a sofisticated hot cocoa! I do use a nut or oat milk though. I haven’t tried goat.